KUALA LUMPUR: Kazakhstan’s Energy Ministry has expanded the oil and gas exploration area given to CaspiOilGas LLP (COG), which Sumatec Resources Bhd is in the process of acquiring for US$205mil (RM873mil), and extended its mining lease by up to 25 years. Sumatec, which provides management and oversight of COG’s concession area (i.e. the Rakushechnoye oil and gas field in West Kazakhstan), said that COG planned to drill up to six more new wells within the field apart from the existing drilling plan proposed by Sumatec. 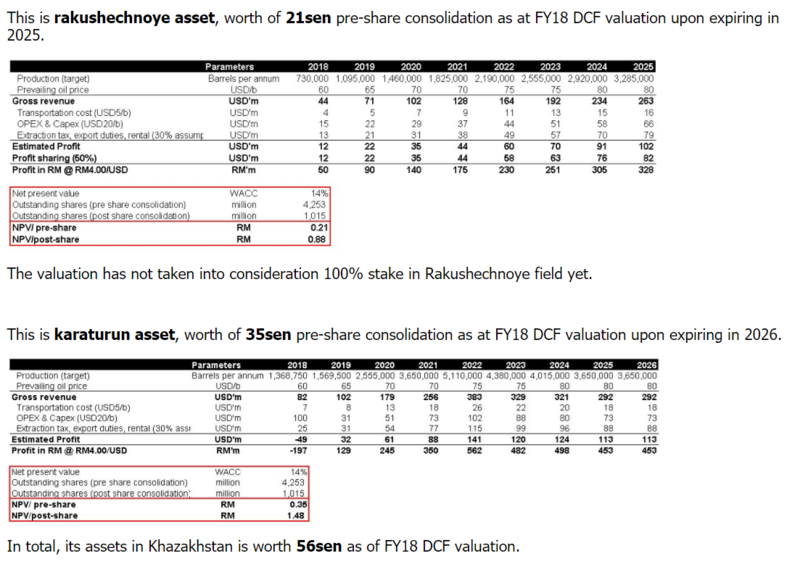 In a filing with Bursa Malaysia on Wednesday, Sumatec said COG’s general director Ruslan Keshubayev confirmed that COG had received an official letter from the Energy Ministry extending the exploration area within the Rakushechnoye lease allotment. Drilling the additional six wells would also entitle Sumatec and COG for a further extension of up to 25 years to the mining lease, it said. COG initially had a 25-year concession expiring in August 2025. Sumatec officially took over the Rakushechnoye field’s operations in November 2013. Based on Sumatec’s annual report issued on May 20, 2015, it had by then finished drilling eight wells, of which six could be put into production. Sumatec had originally planned to develop up to 10 new wells last year but, due to persistently low oil prices, deferred the plan to 2017 and beyond. The Sumatec group reported a loss after tax of RM62.02mil in the financial year ended Dec 31, 2016 (2015: profit of RM37.86mil) due to not having oil-related revenue and making provisions for the amount owed to and corporate guarantee given to its 49%- owned associate, Semua shipping group. Sumatec’s external auditor SJ Grant Thornton expressed a qualified opinion on its 2016 financial statements. According to SJ Grant Thornton, there are material uncertainties which, if not realised, may affect the Sumatec group or the company’s ability to continue as a going concern. 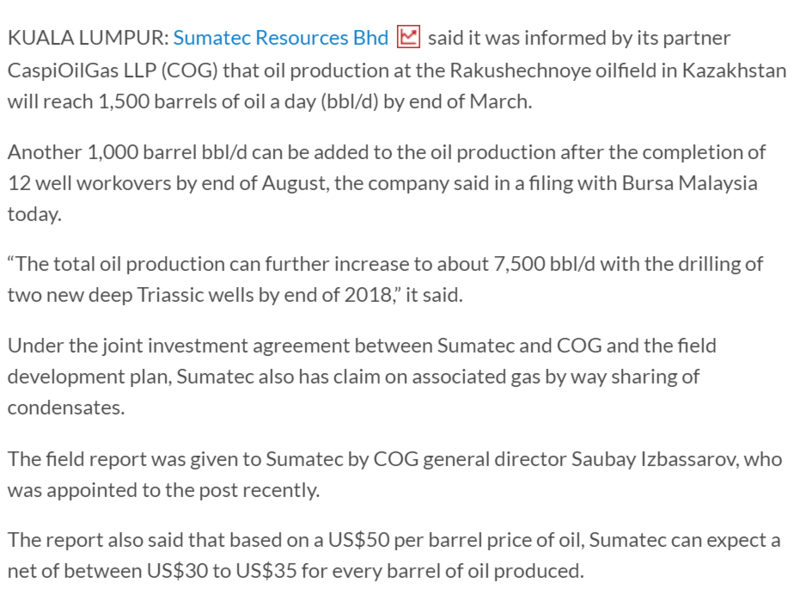 On the same day Sumatec announced the auditors’ qualification (on April 28), it also disclosed plans to ramp up oil production at the Rakushechnoye field. For the third and fourth quarters of this year, Sumatec said it expected the daily average oil production to rise by 500-1,000 barrels per day. It estimated that for the first and second quarters of 2018, the volume increment would be at 1,000-1,300 barrels per day. 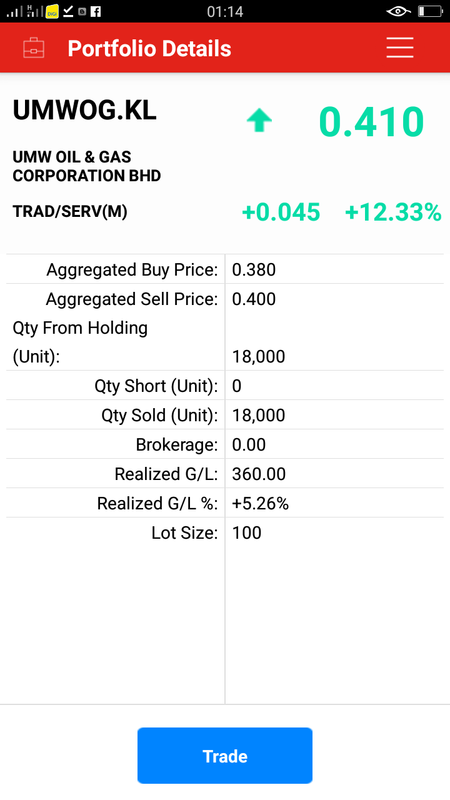 The FBM KLCI (+0.2%) inched higher, in line with the positive developments across its regional peers on Monday. Market breadth, however, turned negative with 685 losers thumping 378 gainers. Meanwhile, glove manufacturers like Hartalega (-16.0 sen), Top Glove (-9.0 sen) and Comfort Gloves (-5.0 sen) fell after the Ringgit continues to appreciate against the U.S. Dollars. Hari ini index Bursa Malaysia di tutup 1817. Anda Semua dah ada akaun Cds ke belum? Hari ini ramai orang buat duit dengan intraday. Anda mahu tunggu atau mahu join sekali?